This is the public profile of William Hailiang Chen, Additional information and high-resolution images are available for accredited press members, to access additional information about William Hailiang Chen please login as a press member. About William Hailiang Chen : William Hailiang Chen has transferred himself from an artist to a professional qualified architect, graduated from the Architectural Association School with awarded Alvin Boyarsky Scholarship and Nicholas Boas Travel Award. 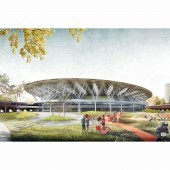 He went on working for UK famous practices such as Wilkinson Eyre Architect, Populous and Foster and Partners on several prestigious projects, including winning the competition of 440m tower of Guangzhou International Finance Centre, the design of London Olympic 2012 Stadium from inception to completion and Apple Campus 2. 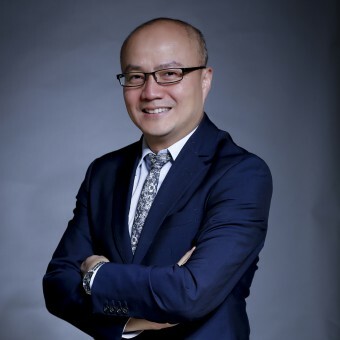 Despite the success in UK, as Principal Architect he took on the challenge back to China leading the team on managing Wanda Group’s overseas projects including Wanda One Nine Elmes, Wanda Sydney One, Paris Europacity and Wanda Vista Tower project in Chicago. Alongside the big projects, as founder of Creative Prototyping Unit he is leading a research team on digital fabrication of various small experimental projects. William teaches part time at the Southeast University in Nanjing and is setting up an urban regeneration research program in relation to sports sector. 2010 – 2011, Architecture, RIBA Part III, Bartlett School of Architecture at University College London, LONDON/UK. 2000 – 2006, Architecture, AA Diploma RIBA Part I/II, Architectural Association School of Architecture, LONDON/UK. 1999 – 2000, English, IELTS Certificate, Barnet College (Hendon College), LONDON/UK. 1996 – 1997, Architecture, Certificate, Southeast University, NANJING/CHINA. 1992 – 1996, Oil Painting, BA, Guangzhou Academy of Fine Arts, GUANGZHOU/CHINA. 2015 – Current, Founder, Creative Prototyping Unit, BEIJING/CHINA. 2013 – 2017, Principal Architect, Wanda Commercial Planning & Research Institute, BEIJING/CHINA. 2011 – 2013, Architect, Foster and Partners, LONDON/UK. 2006 – 2011, Senior Designer, Populous, LONDON/UK. 2003 – 2006, Architectural Assistant, Wilkinson Eyre Architects, LONDON/UK. 1997 – 1999, Architectural Assistant, South China Architectural Design & Research Institute, GUANGZHOU/CHINA. 2017.01, 'ResoNet Pavilion', Sinan Mansions, SHANGHAI/CHINA. 2015.10, 'ResoNet-Baitasi', Beijing Design Week, BEIJING/CHINA. 2010.04, 'ResoNet-Bloom’, Luminale Biennale 2010, FRANKFURT/GERMANY. 2007.09,	‘ResoNet’ installation for FRED07, CUMBRIA/UK. 2003.03,	‘The Penetration of Light’, AAschool photo library, LONDON/UK. 2007.06,	‘As Much As You Like’ installation, 'Get It Louder 07', in collaboration with Chong Boon Pok, GUANGZHOU/SHANGHAI/BEIJING/CHINA. 2006.12,	'AA Camera Club' exhibition, AA Photo Library, LONDON/UK. 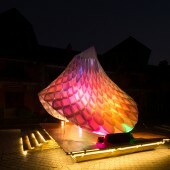 2006.11,	‘Reef Surface Mobile Island’, ETSAM (Polytechnic School of Madrid), MADRID/SPAIN. 2006.09,	Exhibition of global Chinese design achievements, part of China International Decorative Art fair, BEIJING/CHINA. 2003.11,	‘The Discerning Eye’, the Mall Galleries, LONDON/UK. 2008.06,	‘Cutting Edge’ paper cuts part of ‘Friday Late: Beijing’/‘China Design Now’ event, Curator/Organizer, V&A, LONDON/UK. 2018.08, Finalist, Architizer A+Design Award in Unbuilt Sports & Recreation category, New York/United States. 2018.06, Bronze IDA Awards in Architecture Category, Los Angeles/United States. 2018.04, Silver A’ Design Awards in Architecture, Building and Structure Design Category, Como, Milan/Italy. 2017.10, A&D Award in Best Pop-Up Architecture Category, Hong Kong/China. 2017.06, Gold A’ Design Awards in Lighting Products and Lighting Projects Design Category, Como, Milan/Italy. 2017.06, Bronze IDA Awards in Exhibits, Pavilions and exhibitions Category, Los Angeles/United States. 2017.04, Finalist, Architizer A+Design Award in Architecture + Color category, New York/United States. 2017.04, Special Mention, Architizer A+Design Award in Architecture + Light category, New York/United States. 2012.10, Runner Up, International Photography Competition organised by Leigh Day & Co., LONDON/UK. 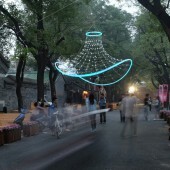 2007.10, First prize, ‘Bright LED’ international competition co-organized by Design boom and Gwangju Biennale Foundation, GWANGJU/KOREA. 2006.10, First prize, ‘Environmental Tectonic Competition v2.0’ held by AA School, LONDON/UK. 2006.06, Highly Commended, International Concrete Design Competition organized by Concrete Center, LONDON/UK. 2004.10, First Prize, Guangzhou West-tower International Competition (IFC Tower), team member from Wilkinson Eyre Architects, GUANGZHOU/CHINA. 2004.09, Alvin Boyarsky Scholarship, AA School, LONDON/UK. 2002.06, Nicholas Boas Travel Scholarship - residence at the British School at Rome, AA School, LONDON/UK. 2015.12, 'ResoNet-Baitasi', Professional Lighting Design, pages 78-81, BEIJING/CHINA. 2015.10, 'ResoNet-Baitasi', Designboom website, MILAN/ITALY. 2013.01, Featured Interview, 'Study at UK' interview series at BBC UK China website, LONDON/UK. 2012.08, Interview about London 2012 Olympic Stadium, Singtao News paper (Europe version), LONDON/UK. 2012.08, Interview about London 2012 Olympic Stadium, Xinhua News Agency, LONDON/UK. 2012.04, Interview about London 2012 Olympic Stadium, 'The Week' magazine, p48-50, SHANGHAI/CHINA. 2009.12, Article: Conversation with Ou Ning, chief curator for 2009 Shenzhen & Hong Kong Bi-city Biennale of Urbanism Architecture, New Architecture Chinese magazine, WUHAN/CHINA. 2008.11, Feature: ‘Reef Surface Mobile Islands’ project, ‘Forming Climate Change’ By AA School, LONDON/UK. 2006.11, Article: ‘Floating cloud: Heatherwick Studio’s Longchamp store’ , Design Magazine, BEIJING/CHINA. 2004.08, Article: ‘the Penetration of Light - Daylight in the GSW HQ, Berlin’, World Architecture, BEIJING/CHINA. 2004.01, Guest Editor: Special Issue on Architectural Association, World Architecture Review, January, BEIJING/CHINA. 2012, 'Transformation-Conversation with Yanchuan Liu', ‘Study at the AA School’, 10 Pages, China Electric Power Press, Yanchuan Liu, BEIJING/CHINA, ISBN9787512317659. 2017, REDesign China Award, SHANGHAI/CHINA. 2017, Sinan Mansions, ResoNet Pavilion, SHANGHAI/CHINA. 2012, Apple, Design Apple flash store/Apple Campus. 2007, Arts Council England, ResoNet Installation for FRED07, CUMBRIA/UK. 2006, Olympic Delivery Authority, London 2012 Olympic Stadium. Press Members: Request an exclusive interview with William Hailiang Chen.